Day 5 - Avez-vous du beurre? The last one stands out the most for me because of the story that went with it. Apparently, my brother didn't pronounce it quite right when he was asked to recite it in front of class. The original attempt to pronounce beurre as rhyming somewhere between 'sir' and 'fur' was dubbed as sub-par. By the time my brother was telling the story that night, the 'u' sound had been stretched out to about two seconds and the 'r' sound had been mostly swallowed and replaced with a weird sound that was somehow a combination of a gargle, a gulp, and a phlegmy throat clear. It was hysterical. 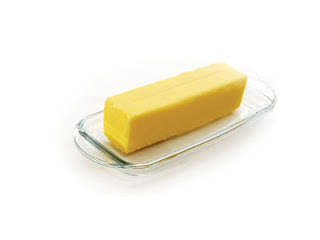 So hysterical that about half the conversation that ensued between my brother and I in the next two days consisted of asking each other about the availability of butter. Every time it got annoying for our parents, we were able to say, "But we're learning French." Flash forward twenty-odd years. We were at the beginning of a family vacation and my nephew was asking for butter for corn on the cob. Seemed like a great time to teach some French. Apparently what I think of as funny translates very well to the three-to-five year age group. We had my two daughters, my nephew and my niece all suddenly very interested in whether they might be any butter. Repeatedly. For the rest of the week. Hilarious for me. Not so much for the rest of the adults.